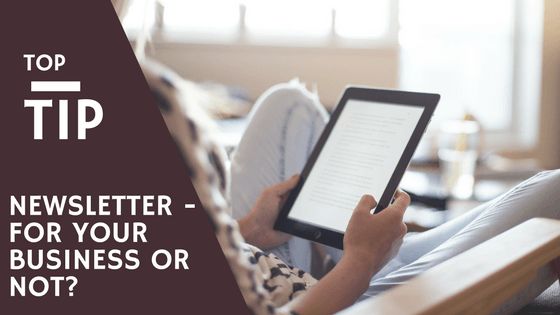 Newsletter… For your business or not? You have Social Media accounts, you have a website, business cards and the odd ad lying around the market but what about other continuous engagement with those that have shown an interest in your company? Nearly every organisation has a regular email that goes out to their consumers, potential and current. For example companies like Wowcher and Groupon send emails to their subscribers filled with current offers available, while Amazon and EBay send out emails with items related to your last purchase. Your newsletter does not even have to be a campaign to push products or services on to people, they can also be used to keep people up to date with information, like service providers who let subscribers know of changes in the services or macro forces that may impact on their businesses such as changes in tax laws. Another form of newsletter is the ‘Hi how are you’ one. Authors particularly use this form of newsletter to keep their readers abreast of the goings on in the editorial process of writing a book. One of our favourite authors Vanessa Kier sends out emails with a sample piece of the writings she is currently working on as well as a little update as what is going on in her life. Keeping them personal yet professional at the same time makes the subscribers feel a part of her world. Her most recent newsletter even has a poll running looking for a name for one of the characters in her newest book with a promise of being mentioned in the acknowledgement – A good way to engage her subscribers. Have you ever considered a newsletter for your business yet thought it would not fit with your industry? Then guess again! Even a simple newsletter saying ‘hi’ once a month or even quarterly can remind your subscribers that you are still around, while bringing your business to the front of their minds regularly. We do not guarantee it will bring in a rush of new business but it allows the memory of your business, and who you are, to stay fresh for a time when your services/products are needed. With the use of engaging and eye catching themes, and content that makes your subscribers feel a part of your world yet still gets your message across, a newsletter campaign can be one of the simplest methods of communication between you and your customers, potential and current. A subscriber tab on your Facebook page, a link on other social media accounts and even on your website are all methods to slowly build up your subscribers list. We currently work with Make-up artists, nutritionists and even a knitter to engage with their customers and let them know what is happening in their world, keeping them abreast not just about their services/products but also just to say ‘hey there, we are still here if you need us’. Not have time or know where to start, then let us get it sorted for you. RedRite will work with you to design a Mail Chimp template that suits you and your business, guide you in regards to the content and can even create the content for you. We import your contacts and get your newsletter out there. A week after each newsletter goes out we will report on the open rate stats. Get in touch for more information today! !